Mash/grate the boiled potatoes and keep it aside. Heat oil in a pan, add curry leaves, green chilli and onion, fry it for 2 minutes on medium flame. Add ginger garlic paste, turmeric powder and salt, mix it and fry it for a minute on low flame. Add grated/mashed potatoes, fry it for a minute on low flame. Add coriander leaves, fry it for one more minute on medium flame, keep stirring. Turn off the flame and take out the aloo bharta in a bowl. Grease your palm with few drops of oil and take small portion of aloo bharta. Roll it in your palms to give it tikki shape, make tikkis from the remaining bharta. Boil a glass of water in idli pot, in the meanwhile grease the idli tray with oil. 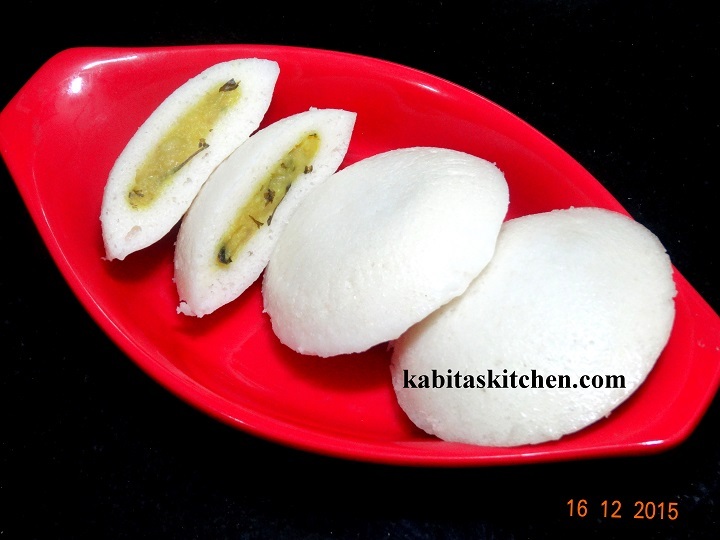 Add little salt into the idli batter and add 1/2 serving spoon of batter in each mould of idli tray. bharta tikki (Make sure the tikkis are covered with batter properly). Repeat the same process for remaining batter, stuffed idlis are ready for steaming. Place the idli tray carefully inside the idli pot and cover the lid. Cook it for 12-15 minutes on medium flame, turn off the flame. Gently take out the idli from tray and serve it with sambar and coconut chutney. Take four bread slices and apply green chutney on one side of these bread slices. 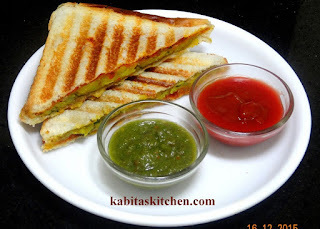 Apply aloo bharta on top of green chutney on each chutney coated bread slice. Apply schezwan sauce on one side of remaining four bread slices. Place one schezwan sauce coated bread slice on each aloo coated bread slice. You may apply little ghee/butter on both side of the sandwiches. Grill the sandwiches in sandwich grill, take it out from the grill and cut it diagonally. Ready to serve with to tomato ketchup. Add soaked black gram and split bengal gram in a pressure cooker. Add 1.5 glass of water and 1/2 tsp salt, close the lid and boil it for 5-6 whistle on high flame. Turn off the flame and let the pressure cooker cool down. Heat a pan, keep the flame on medium and add butter, let it melt. Add grated garlic and ginger, fry it for a minute. Add chopped onion, fry it for 3-4 minutes. Add turmeric powder and red chilli powder, fry it for few seconds with onions. Add tomato puree, mix it and cook it for 2-3 minutes. 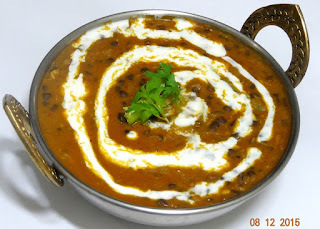 Add boiled dal, mix it and cook it for 2 minutes, keep stirring. Reduce the flame to low-medium, add one glass of water, cover the pan and cook it for 5-7 minutes. Add cream and mix it, add salt and garam masala powder, cover the pan and cook it for 2-3 minutes. Turn off the flame, garnish with butter and cream and serve hot. Make paste of onion, ginger, garlic and tomato. Heat a pan, add oil and let it heat properly, reduce the flame to medium. Add cauliflower and potatoes and fry it for 3-4 minutes, keep stirring. Take it out in a plate and add little oil again in the same pan. Once the oil is heated, add bay leaves and cumin seeds, fry it for few seconds. Add chopped onion and fry it for 2-3 minutes . 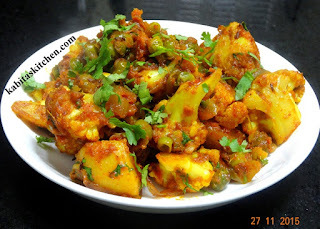 Add green peas and fry it for a minutes with onions, reduce the flame to low. Mix it and cook it for a minute, add the prepared masala paste. Increase the flame to medium and fry the masala for 2 minutes, keep stirring. Add fried cauliflower, potatoes and salt, mix it. Reduce the flame to low, cover the pan and cook it for 8-10 minutes, keep stirring in between. Add garam masala powder, mix it and cook it for another 2-3 minutes(cover the pan). Ready to serve with roti, puri and paratha. Heat 2 tbsp oil in a pressure cooker pan, add shahi jeera and fry it few seconds. Add half of the whole garam masalas and fry it for few seconds. Add turmeric powder,cumin powder, coriander powder, red chilli powder and stir it. Add washed mutton and 1/2 tsp salt, fry it for 2-3 minutes on medium flame. Cover the lid and cook it for one whistle on medium flame. Once the pressure cooker cool down, take it out in bowl. Add green chilli, half of the mint and 1/3 of the coriander leaves in the half cooked mutton. Add 1/3 of the fried onion, ginger garlic paste, curd, red chilli powder, turmeric powder, shahi biryani masala powder and salt to taste. Mix it properly and keep it in refrigerator for an hour. When the rice starts boiling, check the rice, it should be 40-50% cooked. 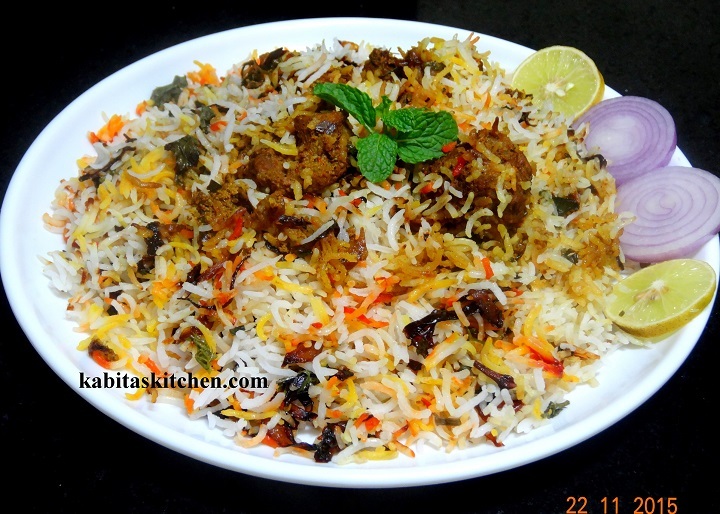 Take out the marinated mutton from the refrigerator. Take a deep and thick pan, put the marinated mutton on the base of the pan. Put little fried onion on it, spread it evenly. Add little fried onion, coriander leaves, mint leaves and ghee again to make second layer. 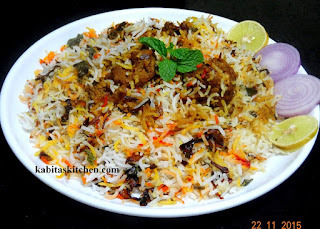 Add 1 tsp food colour on the other part of rice ( you may add kewra water and rose water for restaurant style aroma). Make a stiff dough of wheat flour to seal the edges of biryani pot. Seal the edges of the pot properly so that steam does not come out when we cook it. Cook it for 7-8 minutes on medium flame then reduce the flame to low. Cook it for 7 minutes on low flame, turn on the other flame and heat a tawa. Once the tawa is heated, transfer the biryani pot on it. Cook it on tawa on low-medium flame for 8 minutes. Reduce the flame to low and cook it for another 15 minutes on tawa. Ready to serve with raita or mirchi ka salan, you may garnish it with onion and lemon slices.